The Marci Factor: Diamond Candles as low as $13.99!!! Diamond Candles as low as $13.99!!! So, who doesn't like Diamond Candles? I personally have never gotten a really nice ring in mine, but the scents are nice! 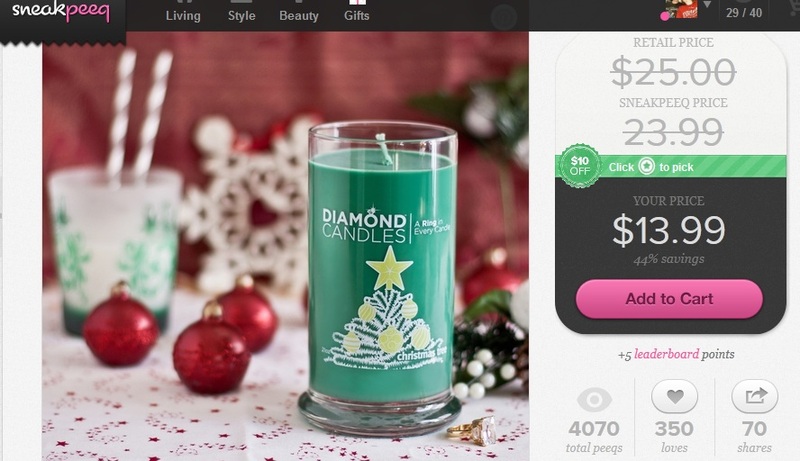 Right now at SneakPeeq, you can get a Diamond Candle for as low as $13.99 + shipping, which is still really cheap! Today (Tuesday) only, you can "Peeq" around and find THREE different badges. Here's the THREE badges you can get today, and you can see it's really worth the time it takes to look around!! This is THREE different items you can get and even cheaper than the already reduced prices at SneakPeeq!! Here is one of the Diamond Candles that you can get at SneakPeeq, but you might want to hurry over, they always sell out fast. The ones that I've gotten in the past have shipped super fast!! Do you have a Trekkie on your Christmas List?? ?